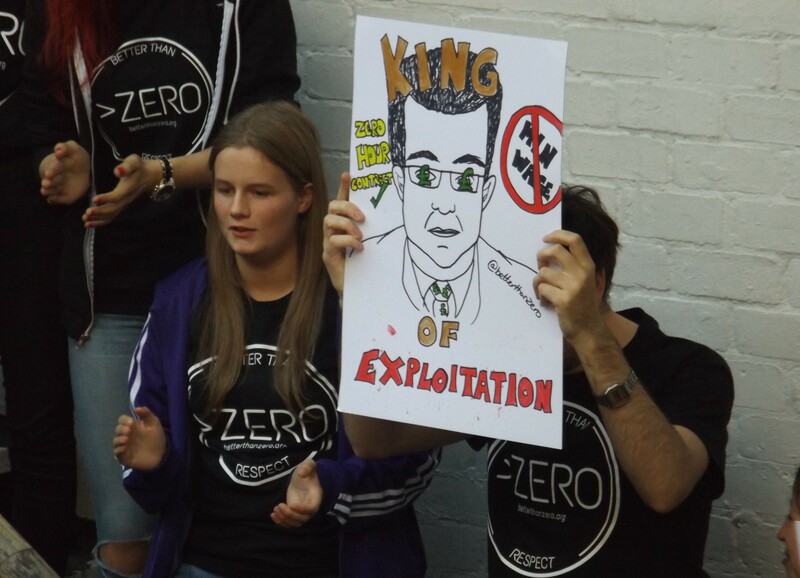 If Stefan King is the ruthless tyrant controlling much of Glasgow’s service sector, then Ashton Lane is his personal fiefdom, a street where the laws of the land (like the minimum wage or discrimination law) apparently don’t apply. King is the publicity-shy pub and club mogul behind G1 Group, whose working practices – whether denying their staff the minimum wage and making them pay for their uniforms, refusing entry to disabled people, opening homages to racist nightclubs, or selling private boothes to allow men to gawk into womens’ toilets – are notorious in Glasgow and beyond. It’s not for nothing that King was one of the original Weekly Wankers on this blog, nor that he’s featured regularly since. 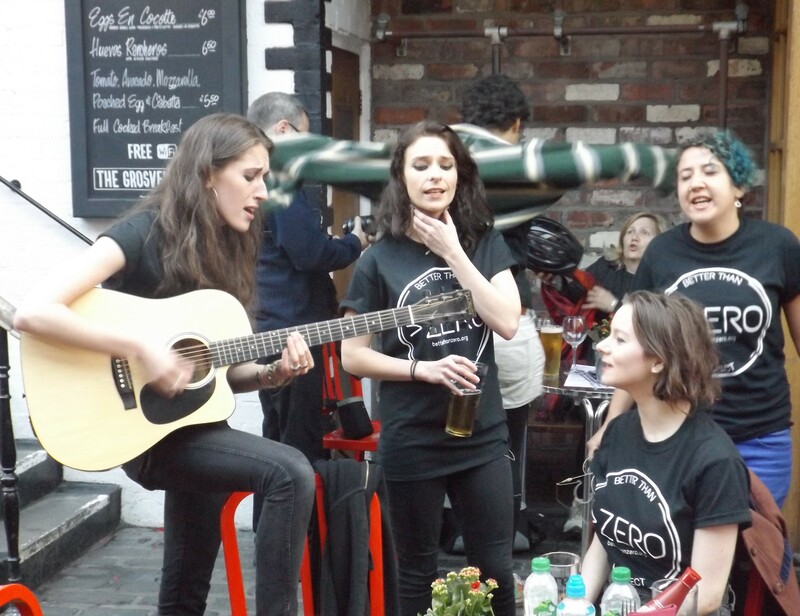 Thursday night was dreich by all accounts, yet come 6.30pm, there was a slight buzz around Ashton Lane in Glasgow’s West End, with dozens of people hanging about on the cobbled, bar-laden street. The nervy atmosphere, ubiqitious tripods and craftily hidden placards were nearly enough to give the game away – but fortunately, it all remained fairly underhand until sometime around 6.59pm. Just about then, a speaker system suddenly emerged atop the balcony of The Loft, G1 Group’s first floor bar. 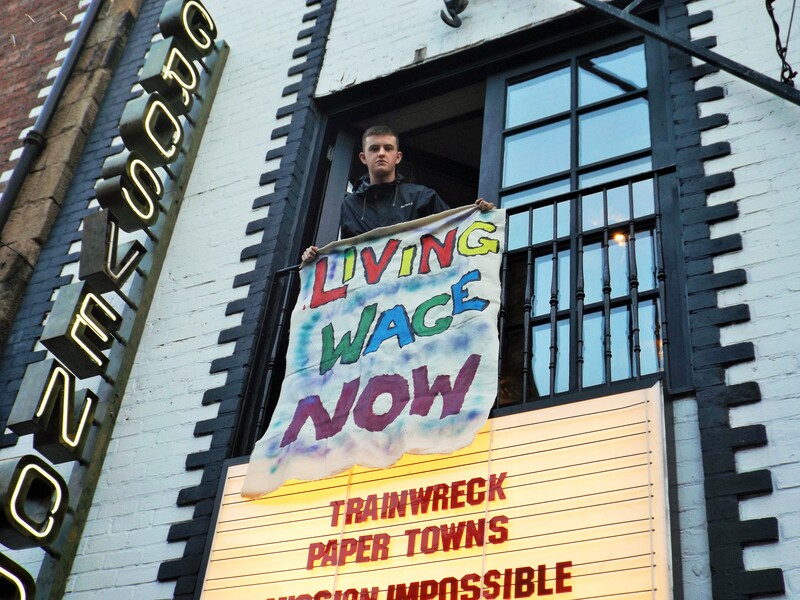 A chorus began, t-shirts came on and – for a brief 15 minutes – the street was taken over by trade unionists and activists furious at Stefan King – who is one of Glasgow’s largest employers – and the mistreatment of his staff. A Thousand Flowers was there as events unfolded. Although the police were called, virtually everyone had left by the time two mounted officers showed up 40 minutes later – maybe they’re just lacking all direction since Stephen House announced his resignation earlier today??!! 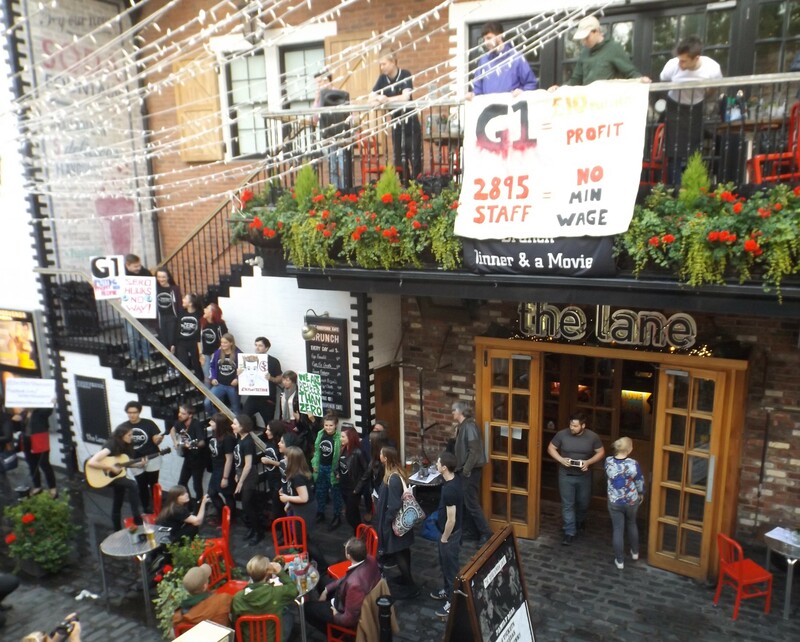 In fact, most G1 staff on Ashton Lane were interested in the protest, and came out to ask about it and request leaflets from the protest organisers, the STUC-initiated Better Than Zero campaign. 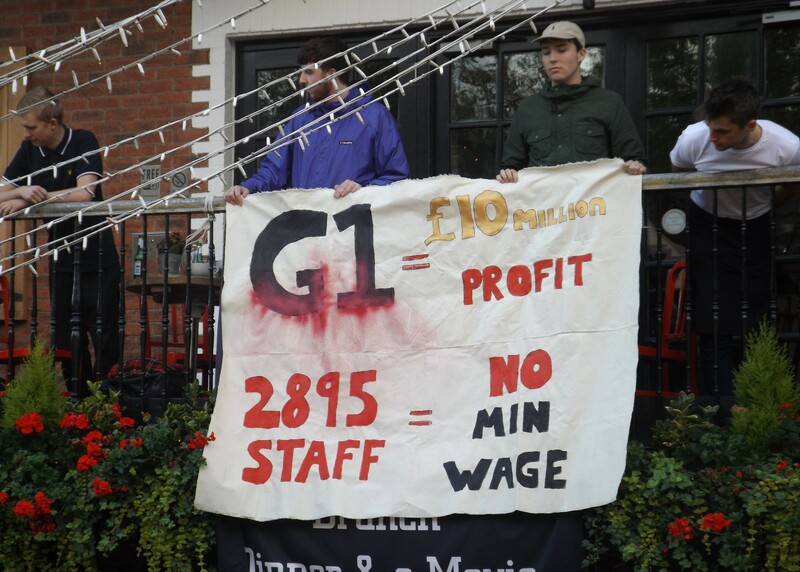 Meticulously planned, the demo saw different groups storm the balcony, steps, entrance and windows in G1 Group venues around the lane. 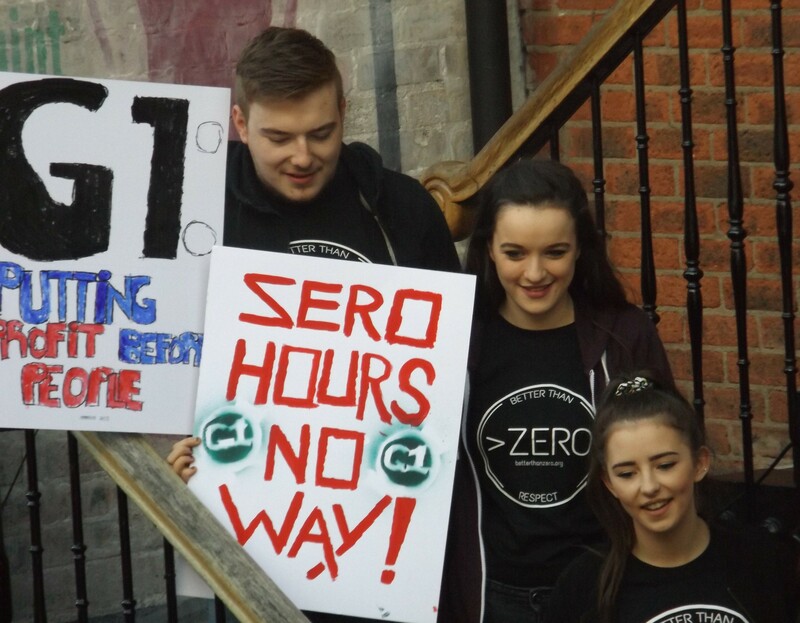 We understand it’s the first of regular stunts planned by the Better Than Zero campaign, who aim to ramp up pressure on employers exploiting young workers in the city and across Scotland. Stefan King was not available for comment (jokes). Hahahaha go the young blood! Its fabulous to see young people standing up and fighting for their right. Thats gumption for ya! It puts me in mind of my younger years marching with the CND. As for those G1 lot, they’re in for a rude awakening. How dare they treat people in such a way. Of course, this is the influence of Westminster on the very idiots who run these places. 2 mounted Police? Who could possibly think that was an appropriate response to this protest size/type/location?